So it has been almost 2 months since I last posted anything. Let me catch you up on what’s been happening…just give me a second…I’m sure there’s been something…Nope I got nothing. Not one thing. Two months have passed, and I can’t really remember much about them. I have been utterly lost in life. Does that ever happen to you? This is not the good kind of “lost.” The kind where you just get so caught up in the moment, caught up in living that things like blogs and email and social media fall by the wayside. That kind of lost (which I don’t even think of as lost, so much as I do just truly living) is ok. More than ok. That kind of lost is simply perfection. What more could anyone ask than to be so entirely immersed in your own life that you forget to play commentator? What I have been doing? It has not been that. That kind of living involves conscious appreciation for each moment that you’re experiencing. It involves being in the moment and knowing that you’re in the moment and loving the fact that you’re in the moment. I’m grateful to have had many times like that (I even blogged about my last one) in the past, and I’m sure I’ll have many more in the future. But that is not what has been going on the last two months. As I said before, I have been lost. I know that I’ve worked. I’ve played. I’ve cleaned. I’ve loved. I’m sure I even enjoyed a large part of May and June. But I don’t really feel it. You know? It’s just one of those times when you look up and go, “it’s almost July? When did that happen?” I have just been caught up in the daily grind. There. I said it. I started to edit myself, but then I thought “why?” What better way to describe the feeling that your life is a chore? There isn’t one. I typed and retyped and nothing. else. worked. So there it is. You can love it or hate it, but you can’t deny the truth that sometimes only an f-bomb will do. And this is definitely one of those times. At least for me it is. You see, I live my life fairly loosey-goosey. I’m not big on structures and schedules. I like to take what life throws at me and run with it. Dinner at 8 instead of 6 so we can capture the fading sunlight? Yes! Cancelled date with dirty clothes and dirty floors so we can have a bonfire with the family? Absolutely! Bedtime moved back to 11 because the lightning bugs were begging to be chased? Fantastic! These are the things that make me happy. These are what make me really feel my life down in my bones. And sometimes a schedule just gets in the way of all that. Call me a hippy, but I just love LIFE. I love my family, my friends, my job. I love doing everything and doing nothing. I enjoy it all. So you can see why it feeling like a chore pisses me off so much. I know I said I snapped myself out of it, but I have to give a shout out to my friend at work. He just would NOT STOP asking me about my blog. He kept it front and center in my mind, which lead to the whole U-Turn epiphany and to this blog, which has now turned into the longest “Hello!” in the world. Thanks for not letting me give it up! Today has been a day that reminded me, more than once, why I chose the name “My Household DISorder.” Note the emphasis on the “dis.” Scratch that. This week has reminded me why. I don’t know if my kids have become messier or if I’ve been lazier, but for whatever reason, I just can’t keep up this week. My house is a disaster. For every one thing I pick up, three more materialize on the floor. I know what you’re thinking parents. “That’s just having kids. Nothing special.” My response? I know it always seems that way, but I swear to god it’s ACTUALLY happening in my house this week. I’ve also been experiencing a little “case of the melancholies” as I like to call it. This means that instead of the mess spurring me into a cleaning frenzy, it has beaten me down. I’ve been stomped into a catatonic state of “I don’t give a damn.” This week has stolen all my mom magic that allows me to be a human punching bag. I am defeated. Knocked out. Life is the champion this round. Given this information you have probably figured out that there hasn’t been a lot of kitchen action this week. I’ll spare you the details, but just know this: Ham sandwiches and bananas. For dinner. Last night. Yeah… Because of this new low, I decided I should get back in the ring tonight and actually feed my family. I should have just stayed down for the count. Since it’s Cinco de Mayo, I decided to make quesadillas. (The fact that they require almost no work and are done in like, 2 seconds, had nothing to do with it. Promise.) I was about to get started in the kitchen when I got a phone call. Since the kids were happily playing in J’s bedroom, I switched the burner right back off and stepped into the living room to take the call. Having lulled me into a false sense of security, my darling children chose this moment to act. I came back into the kitchen to discover the loaf of bread COVERED in mustard. My kids somehow (don’t you wish we could ever know how?!) managed to silently sneak into the kitchen, silently open the child locked refrigerator, silently retrieve the bread from the counter, and silently squeeze half the bottle of yellow mustard onto it. My hearing is admittedly pretty terrible, but this seems impossible. I mean, I live in a double wide for crying out loud! My living room is literally right next to the kitchen! And yet, they made it happen. My small silver lining was that at least the bread wasn’t ruined. The mustard was only covering the plastic. Except that it wasn’t. My brilliant (read:devious) little angels had poked little angel finger sized holes in the plastic first. And then had squeezed the not so little amount of mustard onto the bag. Where it proceeded to seep perfectly into the entire loaf of bread. I surprisingly still made the quesadillas. Which J promptly turned into quesadilla soup all over the dining room table when he poured out his cup. Apparently, my small Cinco de Mayo celebration of quesadillas for dinner wasn’t enough for my kids. They have decided to throw their own party. One in which they release all their inner demons. Is it Cinco de Seis yet????? Did I mention I started this day by accidently calling my boss? At 2:32 this morning? Oh yeah, it happened. It’s a good thing that I’ve known him practically forever. And that we are good friends. And that my whole store team is like one big family. I mean, could you imagine if it wasn’t??? But still, what a way to kick off my day. 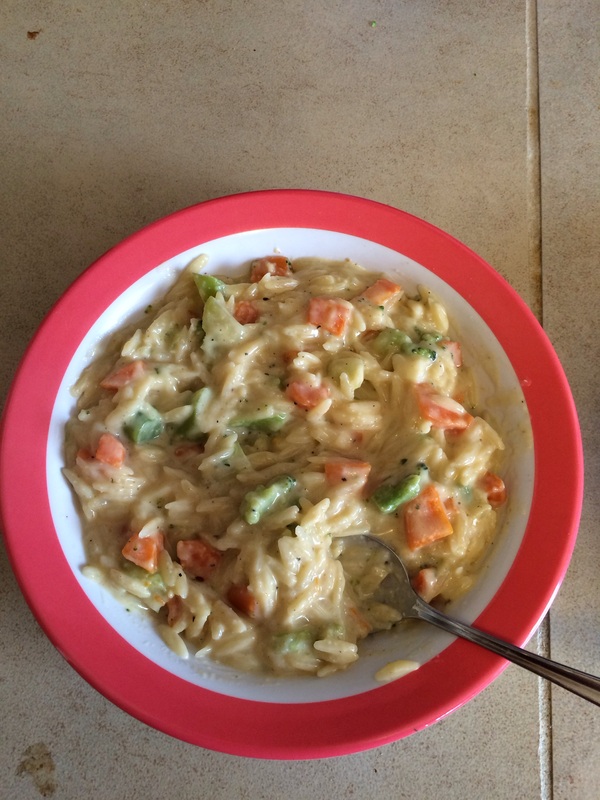 So, last night I finally made the orzo pasta. It was an ordeal and not even worth the effort. I got a late start, which meant I was rushing. This is never a good thing. Speed is my friend in every other aspect of life, but in the kitchen? It only ever leads to pain and suffering. Needless to say, I was not remotely in the mood to eat by the time the dust had settled and dinner was done. Here’s the end result. At this point an old adage comes to mind. “Looks can be deceiving.” TRUE. Very, very true. I did not like this one bit. I’m really weird about texture, and this was just mushy and gross. Luckily, my family is not as discerning, and the kids and husband were able to eat it just fine. Me on the other hand? I feasted on gourmet pastries in the twilight of the evening. Which is to say, I grabbed some Poptarts around 9:00 when the anger finally subsided enough for me to feel hungry. I think S is trying to become the next IPhone photo phenom. She is constantly taking pictures, and gets bent out of shape if her “subject” isn’t cooperating. For example, last night she was having a photo session and decided to get a little artsy. She carefully placed a water bottle just so on an end table and began snapping pictures. 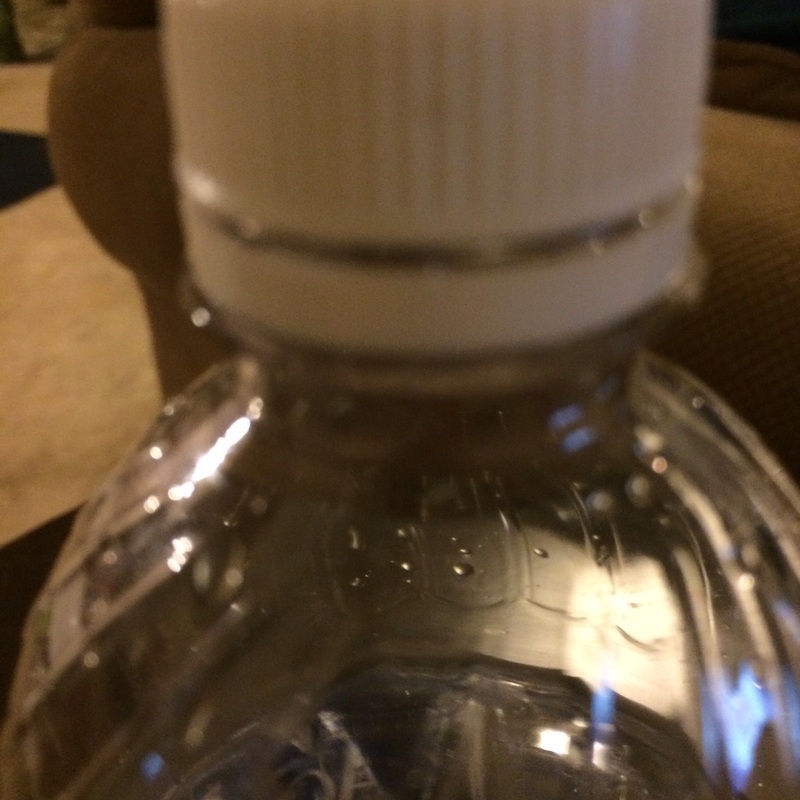 J kept knocking the bottle off. S had an all out artistic fit, frustrated tears, yelling, and desperate attempts to make J understand the importance of said bottle included. Did I mention she’s just barely three? So, I didn’t attempt the orzo past yesterday. The sky was just too blue and the sun just too bright. I HAD to be outside! So after picking my kids up, we played and played outside. By the time we came in, it was after 6:00, and the thought of starting in on a dish was depressing. I didn’t want to spoil the warm, cozy mood the sunshine had lent us, so frozen pizzas were popped in the oven. And I don’t even feel bad about it. This will be an ongoing problem as we get deeper into warm weather. You see, I thrive on sunshine. Ask anyone who knows me, and they’ll tell you. Too many days of rain in a row, and I turn into a depressed, cynical Wednesday Adams caricature. I’m practically unbearable towards the end of winter. January and February really should not exist on my calendar. So when the sun finally comes to save me, I soak it up like a dried up flower after a drought. In fact, we are headed out to picnic at the park right now. It’s another gorgeous day just begging for attention. I’ve spent the morning cleaning, and responsibility can hold me no more. My floors are vacuumed and mopped, and the laundry is moving right along. The kids were little angels and helped me pick up, so we’ve all earned a break. Also, the thought of letting J and S “feed” the sparkling clean kitchen floor gets my blood boiling. So out for a picnic lunch we go! *It may be a slightly selfish reason for taking them out, but a moms gotta do what a moms gotta do. And hey, everyone wins here! Hopefully I’ll feel up to attempting the pasta when we get home. If not it’s going to be PB & J and grapes for dinner. We will just have to see where the sunshine takes me today. Once again, it’s time for lists and grocery stores. What I really should be doing is planning that out. Instead, I’m going to choose to ignore the dwindling supply of food in my house. At least we will be fully stocked up on vitamin D!! Well, it finally happened. I have suffered a defeat in the kitchen. Although if I’m honest, it took much longer than expected. I fully believed I would fail from day one, so to have made it this far before this happened is a victory in itself. And thank God for that! I know myself, and if I hadn’t bolstered my confidence with all my previous success, I would be an angry hot mess right now. I would send the family away to find dinner, slam around cleaning while shouting some explicit phrases at EVERY SINGLE (insert choice word) PAN, and go to bed seething and starving. Luckily, that didn’t have to happen this time. I mean, I have spent years learning not to be a sore loser, but when it comes to the kitchen, all bets are off. So let me break it down for you. I decided to attempt sweet potato and black bean taquitos with a side of mexican seasoned rice. The recipe in itself didn’t seem too complicated, and I thought I could just cook up some rice and season it myself to pair with the taquitos. That should have been my first indication that things were amiss, me thinking I could fly solo on something. I missed the sign though, and so started in on prepping the taquitos. It was a battle from the get go. You see, sweet potatoes are kind of hard to peel and dice. At least, the two monster size ones I had picked out were. I wasn’t prepared for it, and it set the tone for the rest of the evening. I finally got them all cubed up and the beans rinsed and drained, only to realize that I didn’t have the corn the recipe called for. “Small hiccup,” I thought. “I’m sure they will be fine without it.” I continued on with the cheese and seasonings, got the filling all mixed, and lay out my pan to start rolling. By this point, the prep has taken me twice as long as expected (why can’t I learn that those little numbers on recipes lie?! ), the kids are screaming, and I don’t even want to eat dinner. But I soldiered on, hastily rolling the taquitos and popping them in the oven. I then got to work on the rice. It’s well known that rice can be finicky. I have cooked real rice, meaning not pre-seasoned instant rice, only one time before today. For this reason I should not have been as confident as I was. Instead, I chose to make not one but two cups of rice, thinking it would be so good we would all want seconds. I was wrong. I messed up the cooking, did not add anywhere near enough seasoning, and then tried to fix the disaster by adding cheese to make it “cheesy mexican rice.” I didn’t even want to try a bite, but I forced myself to. It wasn’t edible. AT ALL. It was a mushy disgusting mess. The two toddlers would not even touch this stuff. So our dinner consisted of slightly bland taquitos and nothing else. I managed to mess those up too by not following the recipe closely enough. I thought I could just season them myself instead of taking the time to measure everything out. Again, I was wrong. They were at least edible though, and I think the recipe is a keeper if I were to follow it to the letter. Although after my defeat today, I’m sure it will be a while before I can bring myself to try them again. Today marked the official end of my winning-at-life streak. I’m hoping things simply go back to normal. That I just return to being unlucky and carry on my merry way. That the universe does not exact karmic revenge for my winning times to balance things out. I’ll keep you posted. Welcome to the new site! I shocked myself today by actually following through with my plans to revamp the blog this week. It is still a work in progress, but I’m happy with what I’ve done so far. You see, despite the fact that I started a blog, I am not tech savvy in the least. It took me far longer than I’d like to admit (an undisclosed number of hours, yes hours, as in more than just one) to get what I have so far updated onto the page. Several times I thought I had something done correctly, only to go view my page and see none of the changes. I finally managed to get it all sorted out, and here are the results! Let me know what you guys think! I also scored a HUGE win with dinner tonight. It was time to try another new recipe, so I opted for Lemon and Old Bay seasoned Tilapia. I have never cooked anything other than fish sticks before, but I was not as scared as I thought I would be to try this. Maybe it was because the picture on Pinterest looked so good. I was just ready to try it! 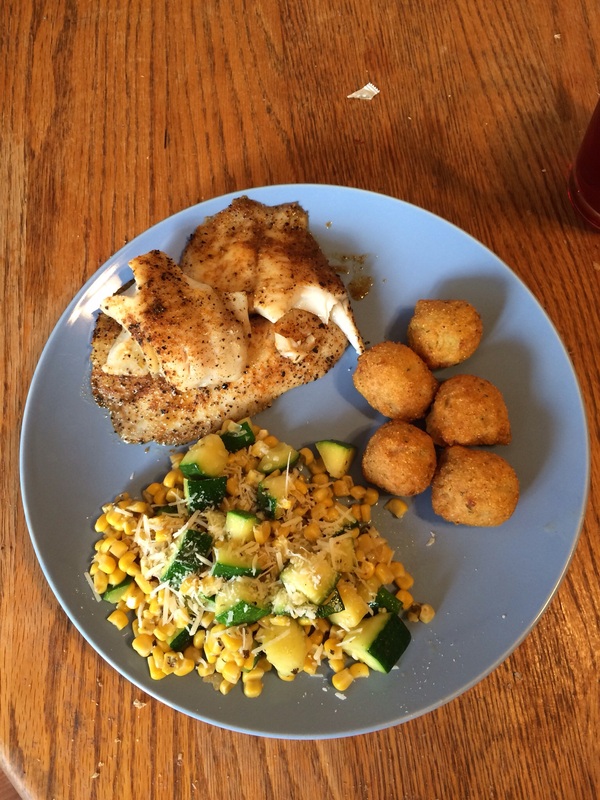 I paired it with another new Pinterest find, parmesan zucchini and corn. Take a look! That’s right, this dinner was good enough to warrant a picture! I mean, I really outdid myself this time guys! I recommend everyone trying both of these sometime because they were both ridiculously delicious. And if you aren’t a fish eater, at least go make the zucchini and corn side dish. I promise you, you’ll thank me. I could have eaten the entire bowl! So today has been just full of successes! And these are coming just behind 3 other major winning moments!! I was champion gamer at Friday game night with my friends. I FINALLY beat my brother at Munchkin on Sunday and Monday I won a contest for the first time in my life! I am currently on a major life upswing, and I’m loving it!! Let’s see how far it can take me! but today was the day. I absolutely HAD to go to the grocery store. I knew it when I went to bed last night, and it was the first thing I thought about when I woke up this morning. I thought that was only supposed to happen with things you love, but I guess any strong emotion (hate, loathing, despair) can do it. I know I should stop complaining about how much I hate grocery shopping, especially since it isn’t something I can stop doing, but it seems to help me get through it. I’m hoping that one outcome of this journey I’m on will be a lessening of my hatred for anything grocery related, but until then you’ll just have to bear with me. So the morning started off tainted, and only got worse from there. I managed to find two packets of oatmeal in my bare cupboards, so the kids did at least get breakfast. Unfortunately, they both decided the floor was hungry and needed half of each of their bowls. And apparently getting mopped can really wear a floor out, so J helped quench its thirst with his entire cup of milk. Yep, we really got off to a roaring start this morning. While all this floor feeding was going on, I was struggling through my menu and list. I have to admit, it actually wasn’t too bad this time. Since I’ve kind of been slacking the last few weeks, I decided to make this a week full of new recipes. This makes my planning easier, as I just go through Pinterest and pick out things that look good and that I think I can execute. Everything’s a trade off though, because an easier menu planning/list writing week usually means a harder week in the kitchen. I’m sure I’ll have lots to talk about. Between the cleaning and the list making, I was done before I’d even left for the store, but as I’ve already pointed out, I could avoid this no longer. So I packed up the kids and headed out. I managed to get a good 10 minutes away from my house when it hit me. I had spent over an hour forcing myself to create a list and then promptly left said list at home. At this point I was too pissed off about the whole situation to shop without it, so I turned around and headed back home. There’s nothing like a little anger to really get me motivated, so I snatched up the list and booked it to the store. I shopped with a fury raging inside and finished in record time. It’s really sweet when your 3 year old tries to clean up the mess for you. It’s not so sweet when what she picks up off the dirty clothes hamper to clean with is a white t-shirt. Your favorite white t-shirt. Your only white t-shirt that you’ve been able to keep white. Until now that is.